Looking for the best waterfalls on Oahu, Hawaii? This list covers all of the top waterfalls, best waterfalls to swim in and best waterfalls for cliff jumping. Manoa Falls is one of my most suggested hikes to visitors looking for a short adventure. The trail is defined for the entire route, which gives you plenty of freedom to take in the wondrous scenery. The hike leads up to a breathtaking waterfall cascading 150 feet down the mountainside. The water might not be as warm as the Pacific Ocean but it sure is refreshing to stand under the natural shower. The beauty the Manoa Falls Trail is that it’s only a $10 cab ride from Waikiki, yet you will feel miles away from the hotels, restaurants, and beaches. The trail winds next to a small stream, passing many different species of plants and trees that will definitely have you stopping for a closer look. During the winter months, the falls are a lot more ferocious than the summer as pictured below. The hike is still a fun one in the summer but don’t expect Niagara Falls in June. 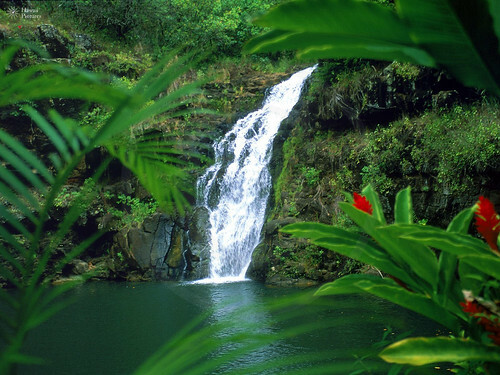 Waimea Falls, also known as Waihi falls is on the north shore of Oahu. It’s one of the most accessible waterfalls on Oahu and is found in Waimea Valley. Within the valley, you can explore the botanic gardens and historic sites. Waimea Falls is 45 foot high and you can jump into the water. Be sure to check the depth and conditions before doing so. I wrote a blog post about the 11 best cliff jumping spots on Oahu you might want to check out as well. This is also a great waterfall for swimming as the pool at the bottom is a great place to relax and hang out with friends. Just across the road from Waimea Falls is Waimea Bay Beach Park, which is famous for its huge surf in the winter and beautiful swimming, snorkeling and rock jump in the summer. 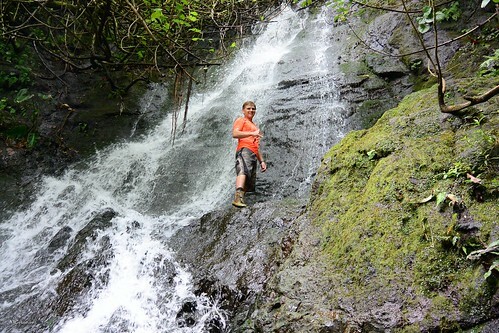 A 2.5-mile roundtrip through beautiful, lush forest and at times muddy trails ends at Mauna Wili falls. It’s one of the most popular waterfalls on Oahu and can get quite busy on the weekends. The falls are just off of the Pali Highway. Cliff jumping is also possible at this location and there are a number of different heights to jump from. I personally know several people who have been injured jumping at this spot so check your depth and for debris if you plan to jump. The waterfall is 20ft and has a great jungle vibe to the spot with thick foliage and vines surrounding the falls. 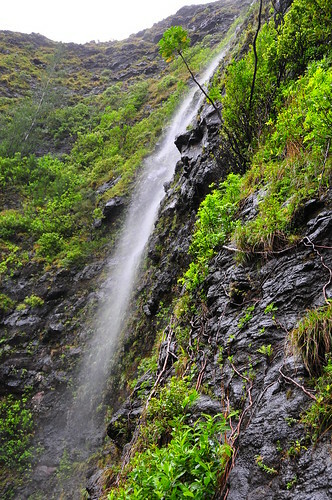 Waimano Falls involves a 3-mile round trip hike. At the end of the trail is the free-flowing falls and two pools to swim in. The route begins at the Manana trail and will take about an hour. 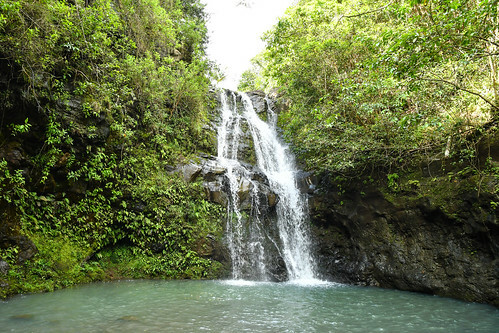 The trek to Waimano falls is through the canopy of the forest and is a great build up to the waterfalls, where you will need a refreshing dip in one of the less popular waterfalls on Oahu. The other awesome part about Waimano Falls is that it is one of the waterfalls on Oahu that is a great place for cliff jumping. The jump is about 15-20 feet. As always check for debris first and check the landing area. Just because your friend did it safely last week doesn’t mean a rock hasn’t moved since or a log is wedged beneath the surface. 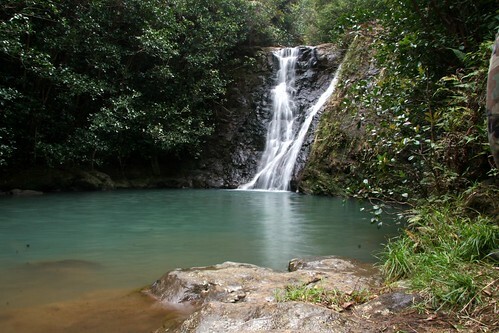 Waimano Falls is the perfect spot for a short trail hike and hangout area for a day trip with friends. **Anyone caught hiking sacred falls must appear in court and will face significant files and possible jail time according to the Department of Land & Natural Resources. Sacred Falls is a bit of a mysterious place. To reach the falls you have to walk through a narrow gorge. Unstable cliffs frequently drop rocks and even helicopters overhead can generate enough wind to dislodge instead boulders and rocks sending them hurtling down into the ridge. Several fatalities have occurred in the gorge of Sacred Falls when huge boulders fell from above. 8 people were killed and over 50 people were injured in 1999. It has been closed to the public ever since. Many places on Oahu are closed to the public and people still visit them. I’ll be the first to say that many of the ‘illegal’ places aren’t very dangerous but this is one place that is closed for a very good reason. Plenty of people still defy the law and risk huge consequences to see one of the most impressive waterfalls on Oahu. It’s a 2-3 hour round trip of 4.5 miles. Despite the hike being illegal and dangerous, there is still a great way you can see one of the biggest waterfalls on Oahu. A helicopter. 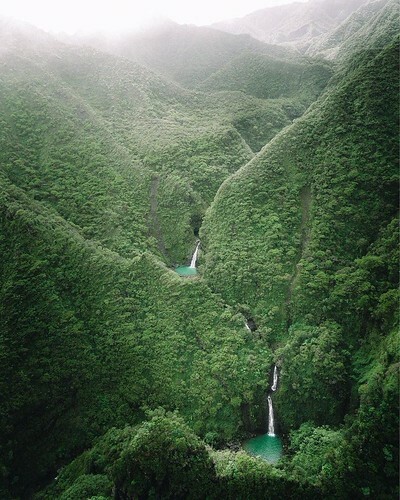 There are multiple companies on Oahu that will fly above Sacred Falls, which is actually the best view. Lulumahu Falls is just off the Pali and a great half-day adventure. The 2-mile trail is relatively flat and only takes about 30 minutes before you reach the stunning, tiered waterfall. There is a small pool at the bottom of the waterfall you can swim in. On the hike to the waterfall, you will pass an epic (illegal) cliff jumping spot. Well, in fact, it’s not a cliff it’s a giant water tower. I don’t advise jumping here as the only people I know who have sent it from the water tower are very experienced divers. However, it’s a beautiful little lead up before you enter the jungle vibes along the trail to Lulumahu waterfall. I’ve added a video of Devin Supertram, a famous youtuber and cliff jumper, doing some awesome flips from the water tower with his mates. Li’keke Falls is one of the lesser known waterfalls on Oahu but has an impressive tiered flow. The largest level of the cascade is well over 15 feet. The 3.5-mile roundtrip hike to the waterfall begins at the Pali Lookout carpark. Other hikes nearby include the Pali Notches and the Pali Puka hikes, which are both great for sunset. The adventure to the falls and back will take about three hours if you spend half an hour or so at the falls. If you are looking to get off the beaten path in Oahu, this is an adventure not many people have heard about. This is one of the coolest hikes on the island, with a Jurassic Park vibe throughout the hike. Vines, giant leaves, and huge boulders make you feel like you are deep in the jungle, far away from civilization. However visiting this waterfall on Oahu is just a fun day trip. The waterfall is a small but powerful 15-foot stream of water with a big pool for swimming. 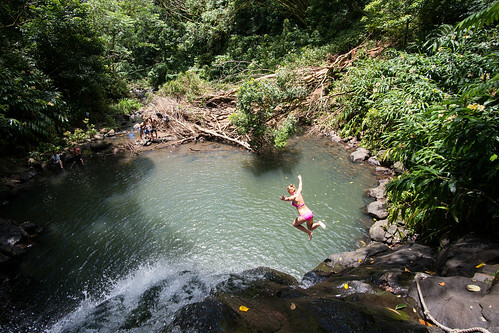 There are several spots to jump from and there even used to be a rope swing at Kapena Falls. 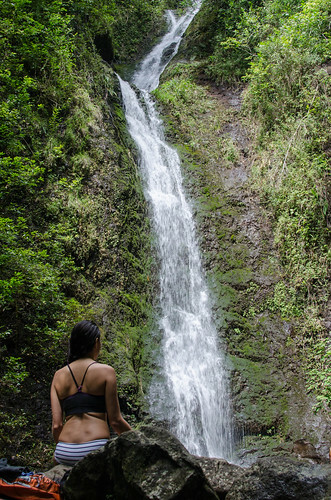 The hike is just off Nuuanu Avenue and is less than a mile so it’s a great way to start off your morning with a short trek through the jungle and a dip in some icy waterfall water. Laie Falls is one of the least trafficked waterfalls on Oahu. This is because it is a lengthy 6-mile trek out and back to reach the falls, which are beautiful but not huge in scale. This is an adventure for those seeking an off the beaten path adventure rather than a huge, spectacular waterfall. The hike is in Laie, which is on the north shore of Oahu. Kalihi Ice Ponds is a short trek just under 2 miles out and back. A small waterfall flows into a large pool but you need to keep exploring. Climb the tope up the falls and discover several other falls and pools beyond the first pool. This is an awesome adventure spot for a day out with friends that doesn’t involve too much hiking like some of the waterfalls on Oahu. The trail is closed therefore making it illegal but it is still commonly frequented, especially on weekends. Waipuhia Falls is a famous spot for a unique reason. This waterfall is also known as the ‘Upside-down falls’ because the strong winds blow the water with such force it gives the illusion the water is actually flowing up the falls. Just off the Pali highwa,y this is one of the lesser hiked waterfalls but definitely worth checking out on a windy, stormy day! Are there any waterfalls you think should be on this list that I left out!? Send me a comment below and I’ll check them out. Makaua Falls, some technical rope climbs up small waterfalls. Wear bottoms and shoes that can get wet. Short and beautiful hike! Go after some consistent rains to see the 200+ foot waterfall at the end! 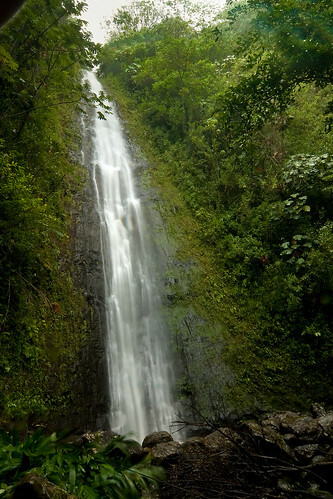 Hamama Falls in Kaneohe is one of the cleanest and prettiest waterfalls on the island. Also Kalauao Falls off Aiea Loop is a really cool swimming hole and great workout! Awesome blog, thanks so much! Heading to Hawaii tomorrow, very excited to find some waterfalls. Thank you so much for providing me with the best information. I would love to visit HAWAII as soon as possible. I wasn’t having any desire to visit the place before, but now after reading your post, I wish like visiting it at least once. Each place you have mentioned is like awesome. This year , actually I was planning for a trip and now I t think I should choose this place.